It was really annoying to have to be stuck watching out for Maura. Ten-year-old Maura was stuck in the middle of the Tazlina, "swift river," perched dangerously on a rock. Millie was getting increasingly irritated at her, telling her to jump to get out of her predicament. Finally after a lot of fussing Maura jumped down into the water, soaking herself. They would soon head back to the village. 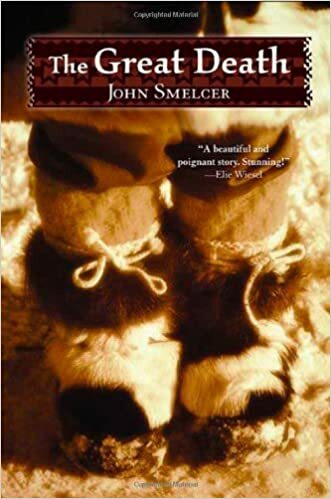 The Alaskan wilderness was peppered with isolated villages that had been there forever, but soon an unforseen plague in the form of a white man would change the girls' lives. In the meantime Millie knew her mother would be irritated when she brought her sister back to the village. No doubt about it, it was at times like these she thought she "hated her little sister." The village had unexpected company. One man from another village came with not one, but two white men. Everyone surrounded them to hear any news of family and friends. The list of the dead was read and they were told that their Shaman was exhausted from tending to the sick. The girls listened as one of the men said, "Death is everywhere, in every house." One of the white men was coughing and had funny red spots on his hands. It wouldn't be long before death began in their village. There were so many that wild animals came in to scavenge the bodies. Everyone began to die, including the girls’ parents. Why weren't Millie and Maura affected? Millie was only three years older than her sister . . . with winter coming on would she be able to lead her to safety through the cold, unforgiving wilds of Alaska? They gathered supplies and began to walk. This story of two young sisters trekking though the Alaskan wilds in a desperate effort to survive will mesmerize the reader. This tale does not hold back the punches in the graphic department as we hear about things such as the look and smell of ghastly corpses. I found myself unable to put this book down and read it in one setting. I liked the subtle way the relationship of the girls evolved from disdain to a more mature, but necessary closeness. No spoiler here . . . you'll just have to read the book to find out what happened to Millie and Maura. Quill says: This stunning portrait of death in Alaska will keep you burning the midnight oil too!